Update: This is the Windows based tutorial. To use OpenType Fonts in Mac follow these instructions. Mac users, check the last paragraph of this article to find out how to get the popular Samantha font for cheap! 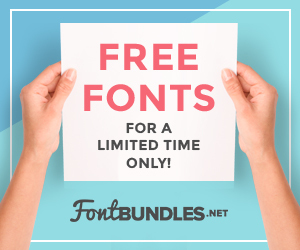 Today, let’s look at how to access some of the additional features of OpenType fonts in Silhouette Studio or Cricut Design Space. To remind you, we looked at several features of OpenType fonts in yesterday’s post TTF vs. OTF – What’s the Difference. To use the tutorial below, you’ll need an OpenType font and a character map or viewer. You can find a character map on your Windows operating system in the Accessories folder or use Font Book on a Mac. Additionally, if you installed NexusFont earlier in the week, you can use the built in character map. For this tutorial, I’m using the standard Windows character map and Isabella Script font. Open Silhouette Studio (or Cricut Design Space) and type in text in the font your want to use in your project. Open your character map and find the OpenType font you chose in Silhouette Studio (or Cricut Design Space). OpenType fonts appear with an O next to them in the font list. After selecting your font you will see a window with a bunch of tiny characters. For the Isabella Script font, you’ll want to choose Character Set “Advanced View” and Group by “Unicode Subrange”. From the small popup window that appears, select “Private Use Characters”. Next, select the letter you want to use by clicking on it. You’ll see that a larger character pops up. Then, click “Select”. Now the character has been copied to the box labeled “Characters to Copy”. Click the “Copy” button. Return to Silhouette Studio (or Cricut Design Space). Highlight the letter that you want to replace and paste the replacement letter from the character map into your project (Control + V). In this example, I replaced the C. The top phrase shows the original, while the bottom show my edited version. That’s it! If you missed any of the posts on fonts you can catch up with them: How to Install Fonts, How to Organize and Manage Fonts, and TTF versus OTF fonts. If you found this tutorial helpful, share it on your favorite social media by hovering or tapping on the image below. « Fonts: OTF versus TTF – What is the difference? I did not know Nexus had a character map. I tried it and found out that if you stretch the character map large enough you can read the characters fairly well. I had been using the Windows character map and the Windows magnifier. I still have not figured out why Samantha creates so much space between lines whether I am using it in Silhouette Studio, or in Word or Publisher. I just left a message and A. noticed some typos and B. figured out what I was doing wrong and corrected the issue. I switched it to Open Type and still needed to change my font type in design space to match, silly me. Thank you for your wonderful blog and Pinterest page!!! Hello, LOVE your site! I have a MAC, where are the directions for using opentype fonts on a Cricut -on a MAC?? Thanks in advance! My husband and I recently purchased a Cricut Air 2. I want to use my design and photography skills for projects. My hubby wants to create items that go with his love of antiques and gas station memorabilia. We have not even begun to think how to merge into selling items. Super thankful I came across your site tonight. Great information business wise and for sparking ideas. Love your site. I am still having trouble using an open faced font with a mac. Any suggestions?